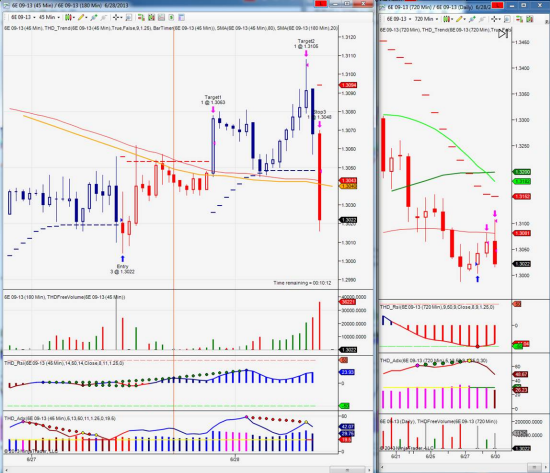 Thank you for pointing out the trade setup between the Euro 45m/720m charts in yesterday’s training room. I don’t trade those timeframes but decided to Sim trade it because nothing else was happening in the markets. What a great learning opportunity this turned out to be for me. Because the trade moved so slowly, I had to mentally slow down and “live” with my trading rules J Whenever I would begin to second guess the trade setup or my stop placement, the trade was moving so slowly I was able to muster the discipline to stick with my rules and just walk away. This process turned out to be valuable in that I had to remind myself a few times why I was doing what I was doing (trading rules) and to stay the course. The trade generated 150 ticks of profit and would have generated another 50 ticks if I had been around to move my last stop up after Clipper 2 hit. 150 ticks of profit is great but the lesson was “priceless” !!! NextSo Glad to Get This!